Here at ChiIL Live Shows, we'll be out for the press opening on the 16th. Check back soon for our full review. We're looking forward to catching this Chicago regional premiere. TATC has developed a great reputation as a stellar urban caliber professional theatre with small town charm (and free parking). We make a habit of bringing home renowned Munster Donuts from a few blocks away, whenever we make the trek to TATC. Theatre at the Center (TATC) presents the Chicagoland premiere of Sean Grennan’s newest play The Tin Woman, starring Erin Noel Grennan in the lead role. The Tin Woman begins previews on July 13 and opens on July 16 for a run that continues through August 13. Inspired by a true story, it’s a heartwarming comedy that’s a beautiful blend of family, humor and hope. Joy has had a heart transplant and is questioning her second chance in life. When she connects with the family of her donor, together they learn what it means to truly give one’s heart. Erin Noel Grennan originated the role of Joy in the World Premiere of The Tin Woman in 2014 at Peninsula Players in Wisconsin. She last appeared at TATC in 2014 in Miracle on South Division Street. Erin has also appeared on the TV series Chicago Fire, Chicago Med and Law & Order. Steve Pickering, who is making his TATC debut, has appeared in TimeLine Theater’s The Last Wife, Lookingglass’ Treasure Island, and The Little Foxes at the Goodman Theatre (more than 30 productions since 1987), is cast as Hank. Steve has performed on Broadway, Off-Broadway, in London’s West End, New York’s Shakespeare in the Park, and in the title role of Macbeth for Santa Cruz Shakespeare. Annabel Armour, cast as Alice, is also making her debut at TATC. She is the recipient of three Joseph Jefferson Awards and two After Dark Awards. She has an artistic association with Remy Bumppo Theatre, appearing in Pygmalion, Fallen Angels, and The Clean House (Jeff Nomination). She has performed in Sunday in the Park with George at Chicago Shakespeare, The First Look Series at Steppenwolf and has received a Jeff Nomination for At Home at the Zoo at Victory Gardens Theater. Doogin Brown, making his debut at TATC, is cast as Jack. His previous work includes Zoya’s Apartment at the Athenaeum Theatre and Saved at Kansas City Repertory Theatre. Cast as Sammy, Kayla Kennedy returns to TATC for the sixth time. Her credits include Nice Work If You Can Get It, All Shook Up, Spamalot, Big Fish and Women on the Verge. Jeri Marshall, who is making her TATC debut as Nurse/Darla, is a Sarah Siddons Scholarship Recipient and holds an MFA from the Theatre School at DePaul University. Linda Fortunato is Artistic Director of Theatre at the Center and Director of The Tin Woman. Linda has been nominated for five Jeff Awards for her work as a Choreographer and Director. She received both the Equity and Non-Equity Jeff Awards for Outstanding Choreography in the 2013-2014 season, garnering TATC’s first award for her choreography of 42nd Street. Linda has been involved with more than a dozen shows at TATC, directing Cabaret, Annie Warbucks and A Christmas Story, and choreographing Spamalot, Big Fish, A Christmas Carol, Guys and Dolls, Crazy for You and Fiddler on the Roof. Sarah Ross is Set Designer. Shelley Strasser-Holland is Lighting Designer. Kevin Barthel is Wig Designer, Victoria Deiorio is Sound Designer. Brenda Winstead is Costume Designer and Brittney O’Keffe is Prop Designer. Matt McMullen is Stage Manager and Ann Davis is Production Manager/Technical Director and Dennis Galbreath is Assistant Technical Director. The idea for The Tin Woman was born when Sean’s sister, actress Erin Grennan, brought him a newspaper clipping she’d saved for years. It was a story about a woman who had received a heart transplant and her eventual meeting with the donor’s family. The Tin Woman uses humor and pathos to explore loss, family and what it means to be given new life. Playwright Sean Grennan studied English at Northwestern University in Evanston, IL. An actor for many years, predominantly in Chicago, he began writing for the theatre in 1995 as co-librettist (with his wife, Kathy Santen) for Phantom of the Country Palace which was produced in the same year at the Marriott Theatre. 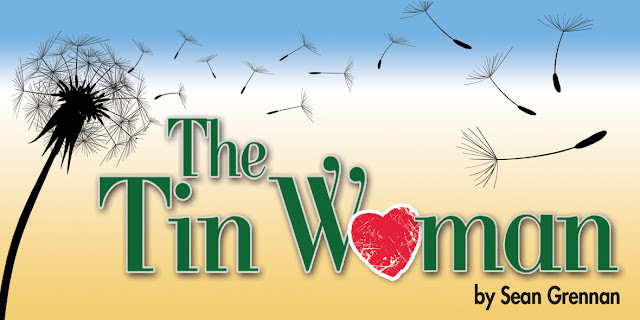 The Tin Woman was first produced in 2014 by Peninsula Players Theatre in Fish Creek, Wisconsin with his actress sister Erin Noel Grennan cast in the lead role as heart transplant recipient Joy. Sean Grennan and his wife live in New York City, where his actress wife appears in Broadway’s Wicked. Founded in 1991, the 410 seat Theatre at the Center is a year-round professional theater at its home; The Center for Visual and Performing Arts, 1040 Ridge Road, Munster, Indiana. Theatre at the Center is the only professional theater company in Northwest Indiana, offering downtown caliber performance in an accessible venue with plenty of free parking. Theatre at the Center is located off I-80/94, just 35 minutes from downtown Chicago. Performances are 2 p.m. Wednesdays and Thursday; 7:30 p.m. Fridays and Saturdays; 3 p.m. Saturdays; 2:30 p.m. Sundays, and select Thursday and Sunday evenings. Individual ticket prices range from $40 - $44. To purchase individual tickets, call the Box Office at 219-836-3255 or Tickets.com at 800-511-1552. Group discounts are available for groups of 11 or more and gift certificates are also available. For more information on Theatre at the Center, visit www.TheatreAtTheCenter.com.